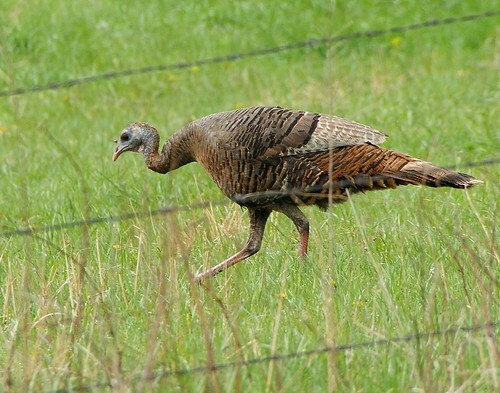 Why Did the Turkey Cross the Fence?, originally uploaded by Misty DawnS. Why did the turkey cross the fence? To get away from that pesky photographer, of course! Turkeys. All I've heard about the last two weeks is turkeys... blah. Turkey season opens Sunday and my husband is a little bit excited. I didn't even know there was such a thing as a wild turkey. You learn something new each day. Have camera. Will take pictures! YeeHaw! What a great shot. So glad you are always camera ready and able to share your shots with us! Hope you can find time to visit. Have a glorious weekend. I think she should run and hide. Wonderful photo and sighting. LOL! We don't have wild turkeys in Sweden so I love seeing them. I have big birds and little ones for CC today. Great shots! Boom&Gary of the Vermilon River, Canada. LOL - my husband knows me well enough by now to guess I'd grab my camera and snap shots first. My father, however, would be shouting to hurry up with the farm chores. I'm sure the cattle drive wasn't held up too much by a few photographs. You didn't have to mention it but, of course, the evidence was in the camera! haha! oh so sorry, but the first thing that came to mind was, "yummm. dinner!"